instructor : Tanaka Makiko→check the artist! The class consists of beginners who want to make 'something' and advanced members who want to create something from start to finish . 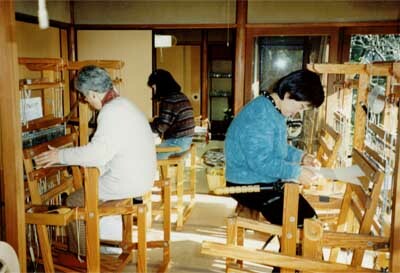 There are many different kinds of hand work involved in the process: weaving with a loom, tapestry weaving, dyeing - natural and chemical , shibori(tie-dye), roketsu (batik), spinning with a spindle/wheel and so on. - intermediate: chemical dyeing, indigo dyeing etc. - advanced: baktik technique, tie-dye ,etc.